Also avoiding bottled water imports, is environmentally friendlier. since when tap water is free? sure, it's light years cheaper than bottled water, but still, it isn't free -- someone is paying for it. and if it was free, then I'd really really be suspicious and probably would never drink it. plus, you surely should expect prices to rise, as drinking water is becoming rarer. finally, when comparing bottled water with tap water, you might be incurring in the same mistake of someone who wonders how can any one even thinking of buying an audi when she can have a ford Ka. Ok fair enough it's not technically free, but the marginal cost of tap water for drinking is basically negligible. 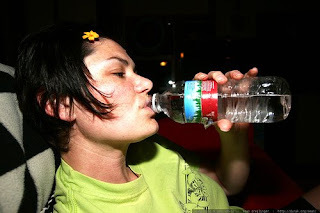 Tight Fist bonus: for drinking tap water, you DO NOT NEED A NALGENE. Marketer1 - "Oh no! These wily consumers figured out that tap water costs almost nothing, but our tap water in a bottle costs $2. Oh no!" Marketer2 - "Well... what if we sold bottles... just bottles, without the tap water?" Marketer1 - "FOR NINE DOLLARS!!" After living in Illinois for a few years with delicious tap water, I can no longer drink mudwater from California. Either you mix it with Gatorade to mask the soap taste, or you buy one of those Brita deals. A. The water is terrible. Brilliant sir! Though I do buy the bottled water, then reuse the bottle. If you clean them right you can get a year or two out of them. Cooper- I have to say, I'm a bit jealous that I didn't think of that excellent point and put it in the blog originally. Thanks for picking up the slack. And Matt, upon moving from Illinois to California I didn't notice much difference in the tap water. But yeah, Brita is a reasonable middle ground I guess. Matt has a point, the water in Ventura County, although it meets all applicable government standards, does taste like the deep end at the OHS swimming pool. Come home Matt, you win! We bought a Brita dispenser. After all I do work for a filter company. I would rather drink my urine, like Bear Grylls, than move to IL for the water! Keep up the good work oh Tight Fisted One! Your blog has changed my life.